A Dirigo Home Equity Line of Credit (HELOC) lets you use the equity in your home to get money when you need it. 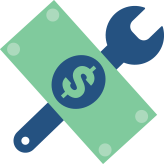 Whether you’re looking to remodel your home, finance your kid’s college, or cover emergency expenses, we can help you get what you need. Limited time offer - pay no closing costs in April or May! Your home is your greatest asset. Use it to pay for what you need. FEES AND CHARGES: Applications for lines of credit in any amount do not require borrowers to pay typical closing costs. The Credit Union will pay all typical closing costs. Typical closing costs range between $779.00 and $854.00. The borrower, however, will be responsible for amounts that exceed the typical closing costs as itemized in the note due to unforeseen or atypical circumstances. The limited time offer to pay no closing costs is applicable to applications received between April 1, 2019 and May 31, 2019. Click the link below to apply or call (207) 783-0351 for more information.